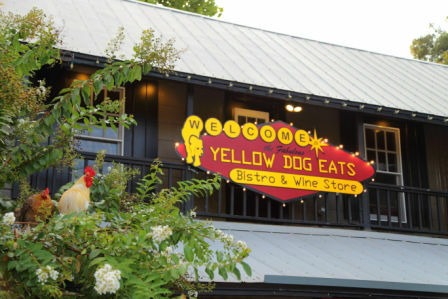 Yellow Dog Eats – Worth The Drive! Today is the first in a new series about off-property restaurants that are really worth the drive to visit. We’ve picked quite a place to start! Yellow Dog Eats is a counter-service restaurant located in Gotha, about a 25-minute drive from Walt Disney World. Yellow Dog is tucked inside a historic property that was built in 1910. It’s known for gourmet home cooking, a laid back atmosphere, and an ever-changing list of draft beers. Once inside, you’re likely be met by a line of regular patrons. The menus are on the left, so grab one to explore – you can expect a bit of a wait to get to the register. 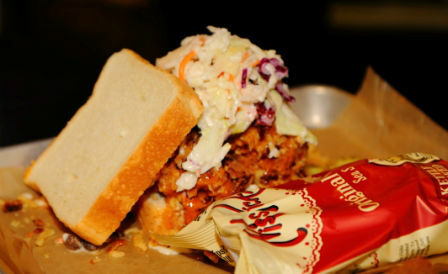 The menu items include heavy sandwiches, wraps, salads with lots of toppings, BBQ, and a list of homemade sides. All sandwiches are served with chips unless you request otherwise. It is worth the upcharge to add mozzarella & tomato salad, potato salad, or some house made penne pasta to your meal. The first thing we tried on our recent visit was the Florida Cracker. This stacked sandwich starts with Sunbeam white bread piled high with pulled pork, coleslaw, gouda cheese, bacon, pickles, and fried onions. I have to admit when it came time to try the sandwich I was nervous because it didn’t seem those flavors would go together. I couldn’t have been more wrong! The cool acidity of the slaw really lightens the dish. It is a fair price at $9.95. However, I did use a fork and ate around that white bread. Overall it was tasty but not a favorite. That might have been because nobody in our party really likes coleslaw. We did see several other people order it, though, so it seems popular. Next up was the Mr. Smokey which also goes for $9.95 and was very popular at our table! 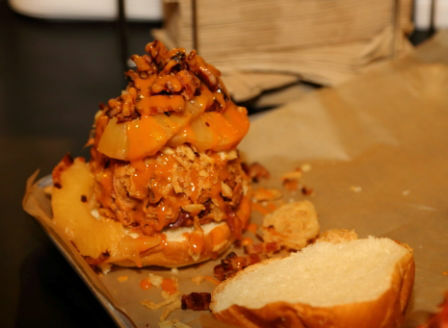 This sandwich starts with a pillowy bun that is topped with pulled pork, smoked pineapple, fried onions, bacon, and house made BBQ sauce. The flavor of this sandwich was amazing! The pineapple does make it a little sweet so keep that in mind when ordering. It’s a good time to mention that Yellow Dog’s house made sauces, salsas and other goodies are all available for purchase.And every sauce, salsa and jam is available as a condiment when you dine it. If your favorite flavor isn’t available, you can open a new bottle and return it when you’re finished. It is just one more feature that makes you feel like you own the place! And this next sandwich will make you WISH you owned the place! 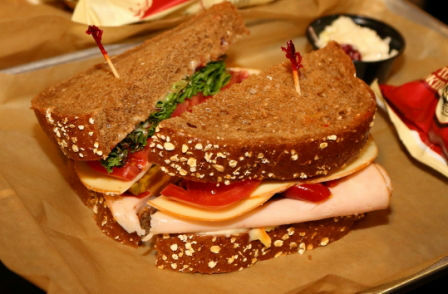 The Rufus is another $9.95 sandwich but this one was the absolute favorite of everyone in our party. 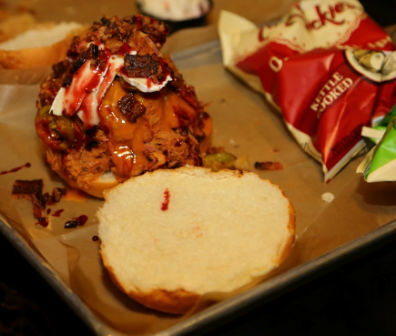 The foundation of this sandwich is the same as the Mr. Smokey, with a soft bun and pulled pork, but the similarities end there. Toppings include thick-cut brie cheese, cherry ring peppers, and raspberry melba. You can also shoestring potatoes, fried onions, and applewood-smoked bacon. But we only added bacon – because who ever turns down bacon? It is definitely heavy, though. Come hungry or bring a friend to tackle this hefty meal. This sandwich pairs great with a drink. Though a wine menu is offered by the glass, many local and unique wines are offered by the bottle. An ever changing beer list is also available. My current favorite brew is tangerine wheat which is so fruity and refreshing it can be enjoyed out on the patio even in the Florida heat. Yellow Dog’s house made sangria and mimosas are also an excellent choice. A nightly happy hour is offered seven days a week from 2 – 5pm. I don’t think it is a coincidence that those are some of the busiest and hottest times in the parks! The last item we tried was the Johnny Rocket. This sandwich was a big surprise! It looks tame but is packed with flavor and a bargain at $8.95! It starts with multigrain bread with smoked turkey, raspberry melba, cherry peppers, tomatoes, smoked gouda cheese, orange- cointreau mayo, and lettuce. This sandwich is bright and flavorful without being as heavy as the other sandwiches we tried. If you’re looking for a lighter choice this one is excellent. You will notice pork is a big part of the menu but they are also very sensitive to vegetarian needs. Seasoned potatoes can be substituted for the meat in many dishes. There is also a complete vegetarian menu available featuring some vegan items. These guys know how to do it right so don’t think you’ll miss out on taste! 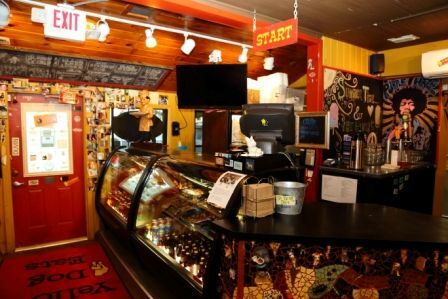 Yellow Dog does an excellent job of showcasing bold flavors like spicy chipotle, homemade peanut sauce, and many others to make for an amazing vegetarian meal. Once you’ve ordered it is time to choose where you’d like to sit. While the main dining room is closest to the counter I encourage you to check out upstairs and the patio out back. Upstairs has very pretty views and an interesting collection of artwork. Not to mention guests have been encouraged to write on the walls and if you’re like me you could spends days reading it all! The back patio is beautiful and shady with strings of lights that give it a magical feeling at night. They also have a stage in this area where local artists perform. Perhaps the most popular patio feature is the chickens which often wonder through while diners enjoy their meal. In fact, when giving directions to Yellow Dog Eats I’ve heard people say when you see the chickens you know you’re close! Wherever you choose to sit don’t be surprised to hear a nutty announcement over the intercom or see other mischief. This is a fun gourmet restaurant that doesn’t take itself too seriously. Think of Cheers with a little bit of Grateful Dead. Enjoy, play along, and see why everyone keeps coming back. So there you have it! I hope that you will consider trying Yellow Dog Eats the next time you’re in the Orlando area. 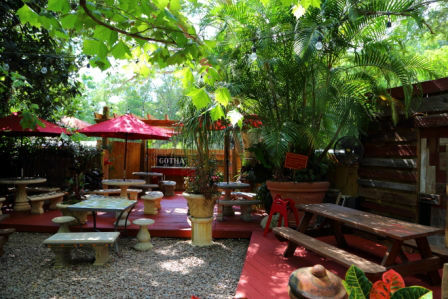 The homemade tastes and quirky atmosphere are sure to leave you wanting more! Don’t forget a sharpie so you can autograph the walls and maybe a photo of your dog to add to their collection. You’ll know you’re close when you see the chickens. 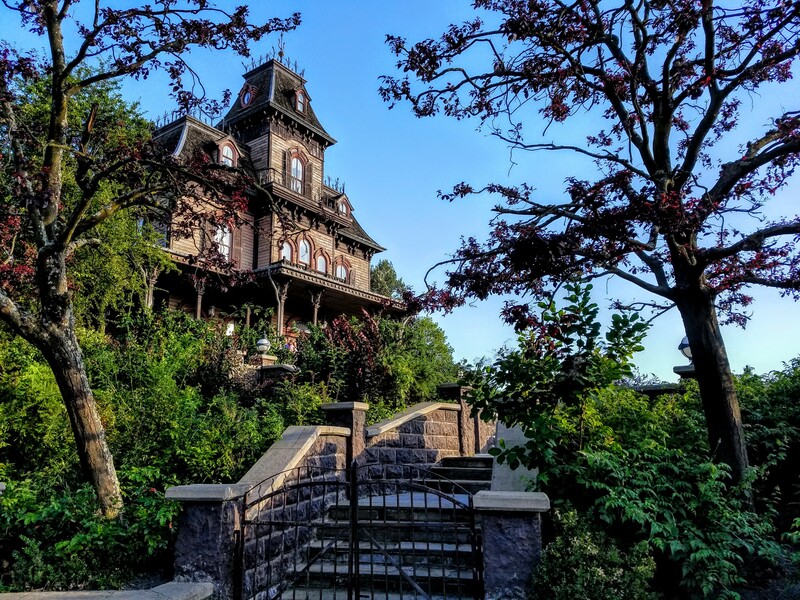 Do you have a favorite off-site restaurant we should try? Let us know in the comments below! Yum! My friend Matthew took me to this restaurant on a visit last year and I agree…totally worth the drive! 😀 I don’t remember the name of the entree I ordered, but it did feature some of that tasty pulled pork! Thanks Heather. Other people have recommended the Ravenous Pig. What’s good there? The menu changes quite often, but the gruyere biscuit appetizer, which I believe is always available, is fabulous. Everything I have had has been awesome. It’s basically upscale, very high-quality pub fare (some call it a gastropub). Cask & Larder is owned and run by the same people and has a similar rotating menu based on seasonal availability, but is very pork-heavy and more southern-inspired. They have a ham tasting flight, if you like ham…My husband went nuts for it. They also brew their own beer on premises and offer an excellent brunch. Ham tasting flight? The place is run by geniuses. Thanks for the tip. Oblivion Taproom????? What a great name! @Kristina I’m glad you loved it as much as I do! @Heather thanks for the great suggestions!! Pharmacy – A speakeasy-themed bar & restaurant near the intersection of , which takes a bit of patience to find, since it’s intentionally hidden away and has no signage. Food and cocktails are incredible, and quite creative! Prato – A kind of modern-take on Italian farmhouse cuisine on Park Ave in Winter Park. Here’s a vote for 4 river BBQ! Best around with unique dishes! Love the idea of off site restaurants. I am always looking for an alternative to Disney fare. Yellow Dog Eats is a go to staple when I am in Disney. Try the Pulled Pork Salad and Pulled Pork Nachos. Nothing Better. Wonderful Restaurant…thanks for sharing information. We were fans of BUBBALOU’S BODACIOUS BBQ. Good BBQ and kid friendly as well. Unfortunately for us, the list of places not eat again while in Orlando with kids is longer than the list with. Would be great if you added a “family with tweens friendly” designation or “allergy-sensitive” designation to your reviews. Thank you for reviewing at off-site dining choices.